You may have seen the OnStar commercial where the viewer is looking through the window of a cop car as it goes after a stolen blue Chevy Tahoe. The law successfully pulls over the Chevy after OnStar remotely starts blinking its lights. Strangely enough, of all the services that OnStar offers, the stolen vehicle recovery feature is what OnStar appears to promote the most. The commercial makes its point, but is it really going to motivate you to cough up a minimum of $200 per year for the service? Think about it… I thought that paying for vehicle theft recovery was covered through our cities’ policing budgets (that we pay for through taxes). And combined with my vehicle’s insurance policy, I think I’ve paid enough already. Of these ten services, there have only been two that I have used and appreciated: OnStar vehicle diagnostics and turn-by-turn navigation. I actually find turn-by-turn to be extremely good and – although some of my friends have found themselves misguided by the directions – it has never let me down. 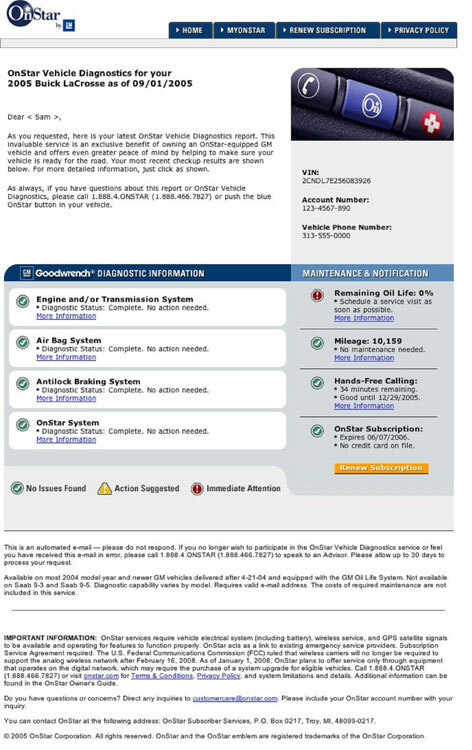 I also like the vehicle diagnostics report that is emailed to me once a month. The report is very clear and goes through the essential systems within my Camaro to ensure that all is copacetic. It’s a very nice feature that allows you to easily keep track of your car’s history. Other than those two services (and hands free calling), the rest of OnStar services are really for emergency use that maybe one in every 1000 subscribers will ever use. And therein lies the question – is the service really of value to us? How often have you needed to contact emergency services while in your vehicle? For example, my Blackberry is connected through the superb Bluetooth connection in my 2010 Camaro and all I need to do is press a button on my radio to call 911. The cost to me? Not an extra penny (besides the cellular service I’m already paying for). To GM’s credit, they do realize that when people are in a severe accident, they may be so gravely injured or in such state of shock that they may be unable to call emergency services. For those OnStar subscribers who have been in that situation, they found the immediate voice of an OnStar agent irreplaceable and therefore swear by it. That experience is what made them true believers. If GM could have us all feel the same way as someone who experienced OnStar during a time of need, we’d all be OnStar subscribers. So even though OnStar faces the challenge of marketing a service we clearly don’t need or want (based on the amount of new GM owners who choose to renew the service after the complementary one year), is there something else that OnStar can possibly provide to make us want to buy it? Let’s look at the following possibility. We have a technology that facilitates communication between the outside world and the driver/passengers in the vehicle. OnStar’s service (over satellite and cellular) allows for rapid transmission of data and currently seems to be underutilized with respect to its overall transmission capacity. What can OnStar do that would make better use of the service’s infrastructure while benefiting the consumer at the same time? What if OnStar offered internet access in your car? How about the ability to download and/or stream movies and mpegs (like our free General Motors podcasts) while sitting in your car? Suddenly, you no longer mind driving your spouse to the mall to do some shopping. What if OnStar combined Bluetooth technology and allowed you to use your handheld device to connect to the Internet at a cheaper rate than what your phone company charges? For all you GM owners who have a navigation screen, how about the ability to use your nav screen to surf the net while killing time (waiting for your significant other at the mall)? We recently wrote about a dealer-installed service for some GM models that allows Wi-Fi connectivity in your car. Yet even this solution – although effective – may be priced out of reach for the average GM customer. And for those of you envisioning idiot drivers attempting to surf the net and drive at the same time – there are ways for GM to prevent this from happening (such as to disable the navigation screen’s web-browsing ability if the vehicle isn’t in park). And here’s another thought – what if OnStar automatically sent you your email, Twitter or Facebook messages and displayed them on the radio information panel or HUD as soon as someone sent them to you? Better yet, what if it read them out loud to you? Who Will Get There First? As you most likely realize by now, GM hasn’t exploited the OnStar system to its full potential. But as sure as the sun sets in the west, one automotive manufacturer will not only bring in-car internet service to market first, they are also going to offer it with a very friendly user interface and at a very attractive price. What The General has going for it is that OnStar has a well-established infrastructure compared to those of other manufactures and can actually leapfrog competitors with a bit of forward-thinking. What’s more, the OnStar brand is well-known, even if people don’t know about every single feature the service offers. Another feather in GM’s hat is Mark Reuss’ decision to have Chris Preuss take over the helm at OnStar. Chris was previously GM’s Vice President of Communications and he did a wonderful job introducing social media to the gargantuan organization. This accomplishment should not be taken lightly: recall the days where your phone call, letter, or email to GM would go unacknowledged. Indeed, GM has understood the value of social media and OnStar is just one more vehicle (pun intended) that gives GM the ability to profit from improved communication. So what do you think? Does OnStar need some more features? If so, how should they be implemented? The "opinionated opinionator", Hylton is the GM Authority Opinion Desk writer and provides thought-provoking pieces on a variety of GM-related topics. Very well written and true! I think that OnStar needs to incorporate features that Sync is going to get… apps and the like. OnStar is actually pretty great but underappreciated and could be much more useful like you describe. Amen to that, Wilson! The only problem is using OnStar for data communication. GPS can’t be used for data, it’s too slow and wasn’t made for that. But overall, OnStar needs to eventually be more along the lines of Sync. The problem is that GM can’t pull it off all by itself – it’s not a software company like Microsoft (who made Sync, based on the Microsoft Automotive Platform). Question: would you rather see Sync-like features branded as OnStar or something else? I don’t fully agree. As a former car sales person I know that not many people see a great advantage to Onstar. The turn by turn works well but I would not pay extra for it with GPS recievers selling for so cheap now. Basically Onstar as it exist today is insurance. Selling insurance is always hard since you are talking about a negative experience that most people would rather believe can’t happen to them. But I pay the $20 a month for Onstar for one reason. It’s my son’s car and he’s 800 miles form home. I like the idea that any time he’s in trouble he can contact Onstar and, if he can’t, they’ll call him. I also like the remote diagnostics, especially since my son is so far away. I do agree though that Onstar needs to add more applications in order to remain viable. Well it looks like GM has a few like minded thinkers over at OnStar! Great to hear that OnStar will now take advantage of their superior infrastructure and offer things such as text messaging and Facebook updating. Great Job Chris and Nick!